Whenever I go to Target, I always snag those pricey little bags of gourmet popcorn with nuts and drizzled with chocolate. Since I’m on a stricter budget right now, I figured this was something I could easily make myself. Well, not only was it easy, but it tastes amazing–buttery, rich, and crunchy. And you get to choose your own additions for the mix (what’s better than that?). I opted for Reese’s Pieces for the peanut butter and crunch, and mini Rolos because I figured chocolate and a little extra caramel couldn’t hurt. Unfortunately, the caramel pretty much settled on the bottom of the cookie sheet so it looks ugly (but still tastes delicious). I just broke the pieces apart and no one will ever know. Shhh. Next time I’d probably add mini chocolate chips or something that would melt a little easier. 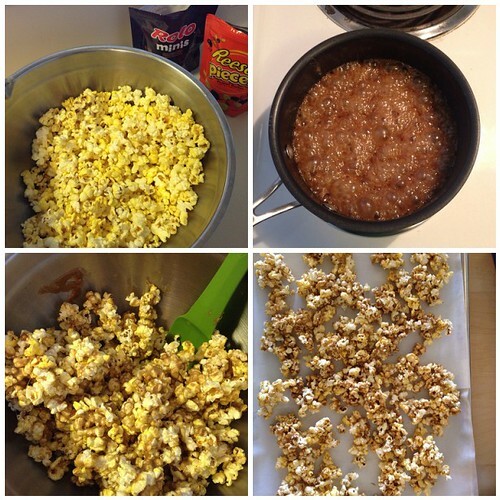 Combine butter, corn syrup, and brown sugar over medium heat. Cook and stir until mixture boils. Continue boiling at a steady rate for 4 minutes without stirring. Remove from oven and add toppings. Let cool before returning to bowl. While down in San Diego at my parents’ house for Mother’s Day weekend, I happily discovered the last few Rice Krispies Treats my sister had made sitting on the kitchen counter. 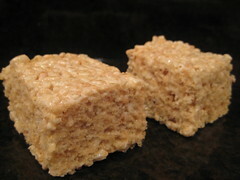 Knowing they weren’t going to last long, and in the mood to make something easy yet delicious, I thought it was the perfect opportunity try this adult twist on Rice Krispies Treats. 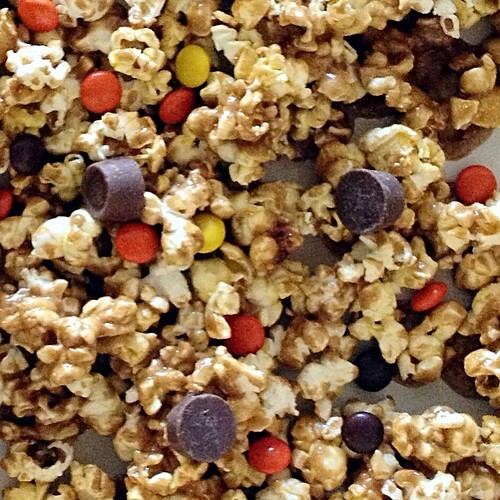 While these may look like your typical Rice Krispies Treats, they’re definitely not. Sure, they’re sweet and chewy just like the original, but when you’re least expecting it, the salt makes a very welcome appearance. And while I didn’t really notice any difference from browning the butter, I’m not complaining. These treats are yummy! When I was kid, every year just before Labor Day my dad and I were among the first people to visit The Franklin Cider Mill when it opened for the season. We would gorge ourselves on fresh apple cider (you could even watch the wheel crush the apples!) and hot greasy doughnuts, fresh from the fryer. And there was always a caramel apple that would find its way to our house too. You’re probably wondering why I’m telling you about a cider mill in a post about peanuts, aren’t you? Well, it’s the smell. The smell of the sugar and spices coating the peanuts while heating in the oven smelled exactly like the cider mill. And for a few hours, my apartment here in Los Angeles smelled like my childhood in Michigan. Trippy. And delicious. And so are these peanuts. Of course, the original recipe called for pecans, but I’m not a fan so I subbed in peanuts. I’m pretty sure you could use most kinds of nuts. Anyway, these are the kinds of nuts that would go well in a salad, but trust me, they’re just as yummy going straight from your hand to your mouth! In large bowl, beat egg whites and salt until foamy. 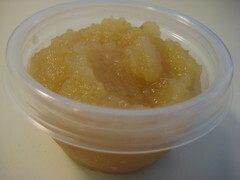 Gradually add sugar and apple pie spice, beating just until blended. Add peanuts and stir to coat. 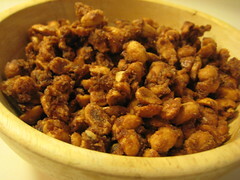 Spread peanuts in a single layer in prepared pan. Bake about 30 minutes or until peanuts are crisp and butter is absorbed, turning peanuts over with a metal spatula every 10 minutes. Cool peanuts on baking sheet until crisp, about 2 hours. Store tightly covered. Recipe adapted from Domino Sugar. I was in the mood for something sweet and salty to snack on while watching the Olympics, but unfortunately didn’t have anything that fit the bill in my house. So, I made these. Only three ingredients, and pretty easy if you don’t burn yourself with hot sugar like I did the previous time. While they are a little tedious (stir constantly, look for the color to change, stir again), they are worth the wait! Have a parchment – or, better yet, a silicone mat-lined baking sheet at the ready, as well as a long-handled wooden spoon (you’ll be cooking sugar that will climb to over 300 degrees F, so you’ll want to keep as far away from it as possible) and a medium (about 2-quart) heavy-bottomed sauce pan. Put the sugar and water in the saucepan and cook over medium-high heat, stirring, until the sugar dissolves. Keeping the heat fairly high, continue to cook the sugar, without stirring, until it just starts to color. (If sugar splatters onto the sides of the saucepan, wash down the splatters with a pastry brush dipped in cold water.) Toss in the peanuts and immediately start stirring. Keep stirring, to coat the peanuts with the sugar. Within a few minutes, they will be covered with sugar and turn white – keep stirring until the sugar turns back into caramel. 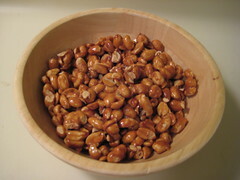 When the peanuts are coated with a nice deep amber caramel, remove the pan from the heat and turn the nuts out onto the baking sheet, using the wooden spoon to spread them out as best you can. Cool the nuts to room temperature. When they are cool enough to handle, separate the nuts or break them into small pieces. Recipe part of the Snickery Squares recipe.